PASADENA, CA– The North American Travel Journalists Association (NATJA) announced today that Irene S. Levine, creator of MoreTimeToTravel.com won a Bronze award in the 2014 Annual NATJA Awards Competition for her story entitled, “Bicycle Vacations: Boomers’ Latest Travel Trend,” which was published by PBS NextAvenue.org. Awards were given to publications, travel writers, and photographers whose work was represented in print, electronic and online media from October 2013 through September 2014. Additionally, awards were given to the top convention and visitors bureaus, PR agencies or destination marketing organizations. The competition, now in its 23rd year, honors the “best of the best” in travel journalism. This year’s Grand Prize winners were selected for their superior execution of narrative and photography. Congratulations to those winners–National Geographic Traveler, Visit Tampa Bay, Michael DeFreitas, my journalist colleagues Michael Luongo and Rebecca Rhoades–and to all the other winners and finalists. The complete list of 2014 award winners can be seen here. 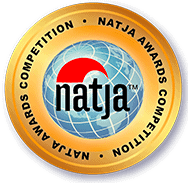 Irene also received Gold, Silver, Bronze and finalist awards from NATJA for articles published in 2011, 2012 and 2013. Congratulations Irene! I’m so happy for you for this well-deserved award.